Walter Salles and Daniela Thomas return to Brazil to make Linha de Passe, a mediocre, if distinctly Brazilian, ensemble drama about a single mother in Sao Paolo trying to raise four sons, each of whom is embarking on at least a metaphorical quest for a father figure. 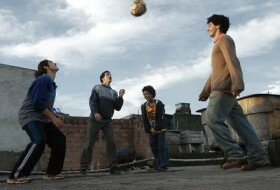 Making good use of its urban backdrop (most of the film’s visual highlights are found on Sao Paolo’s highways), this movie becomes an essay in the ways that religion, soccer and crime fail to fill the void left in these boys’ lives. Moody and dour, to no particular end, except perhaps to drive home the insatiable restlessness of the characters, Linha de Passe is hamstrung by its contrived plotting and thematic inelegance. Most of the film is obvious to the point where everything feels preordained. Occasionally, it manages a looser, improvisational feel, but most of the script’s calculations are too readily apparent. The adequacy of the performances, the sound design, and the cinematography are overwhelmed by the unmistakable inadequacy of the script and editing. The biggest problem with Linha de Passe is that Salles and Thomas can’t really manage their narrative. They seems to have taken on more than they can handle, even though the structure here is not particularly complex. As it moves back and forth between the plot strands, Linha de Passe’s frequent cross-cutting doesn’t manage to build viewer interest, even as it maintains a downbeat mood. Instead, the gear-shifting lowers the energy level, to such an extent that it drains any sense of spontaneity from the proceedings and squanders the charisma of the likeable cast. Whatever sociological impact or real-world excitement the film’s neo-realist approach might have stirred up is diluted by the clumsy plotting and awkward pacing. The film’s style begs comparisons to early Rosellini, but they shame this effort. These characters move inexorably toward false climaxes that simultaneously occur to provide the film a false conclusion. Linha de Passe’s ending, which conflates their stories with a reductive finality, reduces the film’s neorealist impulses, which would suggest that they should continue to develop as fully formed people. Instead, they are revealed to be cogs in a canny script’s machinations, each a simple archetype with stultifying, all-consuming daddy issues. In sum, Linha de Passe is a noble effort, sure to find favor with audiences predisposed to its message, but unenlightening for those who have seen such material handled with more skill.